Governments and financial institutions are showing increasing interest in bitcoin, as Société Générale and Tunisia’s Ministry of Communication Technologies and Digital Economy, set sights on cryptocurrencies and distributed ledgers. 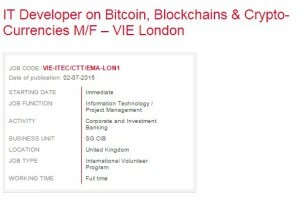 Following the lead of the likes of Barclays, UBS, Bank of England and Citigroup, Société Générale, the third largest bank in France and the sixth largest in Europe, is now diving into cryptocurrencies, as the bank seeks to hire an IT developer on bitcoin and blockchains, to integrate its team in London. Apart from having a Master degree from an Engineering School or University in IT, the candidate need to have experience in IT, in a banking environment, or in cryptocurrencies or a fintech startup. 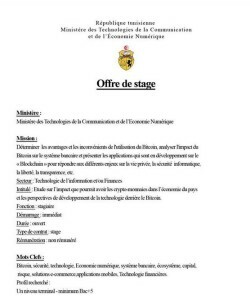 Earlier this month, the Tunisian Ministry of Technologies of Digital Communication and Economy, said it was looking for an intern to study the impact of cryptocurrencies on the country’s economy as well as the development prospects of blockchain technology. [The mission consists in] determining the advantages and the disavantages of bitcoin usage, analyzing the impact of bitcoin on the banking system and presenting the blockchain applications that are currently being developed to respond to various issues relating to privacy, information security, freedom and transparency. Distributed ledgers, which can be programmed to record anything of value, will considerably change finance, has said Blythe Masters. Masters, who was recently appointed CEO of Digital Assets, is one of the many bankers to ditch Wall Street for the more appealing fintech sector. According to a recent report conducted by Greenwich, 94% of the financial professionals interviewed believe distributed ledger technology could be applied in institutional markets. The survey also found that nearly half are actively reviewing the technology within their firms. Among the largest firms that are exploring blockchain technology and distributed ledgers, Citigroup made headlines earlier this month when it announced it has developed three blockchains with its very own token, dubbed Citicoin. „It’s in the labs, but it’s to make sure we are at the leading edge of this technology and that we can exploit the opportunities within it,“ Ken Moore, head of Citi Innovation Labs, told the International Business Times UK. As of Barclays, the bank has signed a proof of concept with Safello, a Swedish bitcoin exchange, to explore how the blockchain could be used in traditional finance. Safello is one of 10 companies signed up to the bank’s start-up accelerator, with Barclays considering partnerships with seven of those 10. In June, Nasdaq OMX Group Inc. announced a partnership with infrastructure provider Chain to use the blockchain to issue and transfer the shares of privately held companies. In a few months, the firm will become the first major exchange operator to use blockchain tech, Bob Greifeld, Nasdaq Chief Executive Officer, told Bloomberg. Also Deutsche Boerse and the largest derivatives exchange CME announced that they want to analyze how the Blockchain technology can be implemented in its IT architecture. Bank of England, on the other hand, has said that central banks are looking at ways to implement „hybrid systems“ involving distributed ledger technology. Furthermore Singapore’s central bank is not only studying this technology, they also plans to active invest into the bitcoin technology. Blockchain is part of a five year 225 USD Mio Investment Plan.